The Etherington Brothers, creators of the UK’s most successful comic Kickstarter of all time, How to THINK when you DRAW, which raised a record-breaking £1/4million in just 27 days, will be attending the Portsmouth Comic Con on Saturday 4th and Sunday 5th May 2019 with all their books including many sold-out and hard to find titles. Having produced comics, art and stories for Disney, Dreamworks, Aardman, BBC and many of the world’s leading book publishers, the Etherington Brothers are the creators of numerous comic series including Long Gone Don, Von Doogan, Freaky and Fearless and Stranski. Passionate about sharing art and writing skills, their free ‘How to THINK when you DRAW and WRITE’ tutorials are used by hundreds and thousands of artists from beginners to seasoned professionals at the world’s biggest animation, film and games studios every week. The Etherington Brothers are the latest of a stellar line-up to be announced which includes Roy Thomas, one of the most important figures of Marvel Comics and the comic industry, and his seminal contemporary, Steve Englehart. Further guests recently announced include Tomm Coker (The Avengers, X-Men, The Black Monday Murders), Mack Chater (Briggs Land, Sword Daughter, Black Panther), Russell Walks (Star Wars, Star Trek, Doctor Who, Lord of the Rings), Sean Phillips (Criminal, Wild C.A.T.S, Batman, Hellblazer) and Ian Edginton (Stickleback, Leviathan, Judge Dredd). With a special emphasis on the 80th anniversary of Batman and because it is Star Wars weekend, a full programme of panels, displays, workshops, exhibitions and entertainment is also being planned along with an even bigger Comic City of comics, art, prints, crafts, toys, collectables and merch. The University of Portsmouth are confirmed to return, showcasing the best of immersive technology including VR, motion capture, robots and demos, Game Over will provide hands-on retro computer gaming fun and a Steampunk Deck will feature the magnificent tea duelling! Event partner, GoGeek Events, will add an interactive and fan-focussed twist leading cosplay competitions and adding a wealth of costumiers and props from all areas of fandom. Tickets with an Early, Early Bird discount are available until 31 October, after which time the prices will rise. 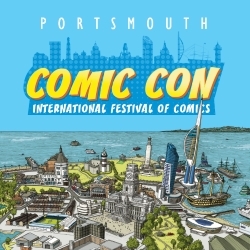 A sell out event in 2018, people are advised to book early to avoid disappointment at www.portsmouthcomiccon.com or 0844 847 2362 (calls cost 7p per minute + phone company access charge). For further announcements follow @PortsmouthComicCon on Facebook or sign up online to receive e-newsletters.